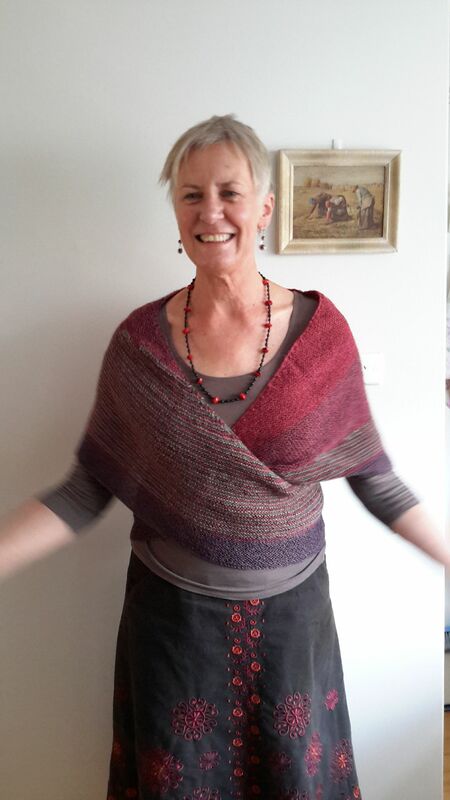 The colour affection shawl I knit a while back finally found the perfect home as a birthday present for a dear friend–here she is in her gloriousness, modelling it. With the Gleaners in the background for added wonderfulness. I am delighted that she likes the shawl. I can’t think of a better place for it to be than with her while she is working in her very demanding job (and perhaps even playing). Long may it warm and comfort her. Happy birthday!! In more prosaic news, it’s the season for making string from our daylily leaves. 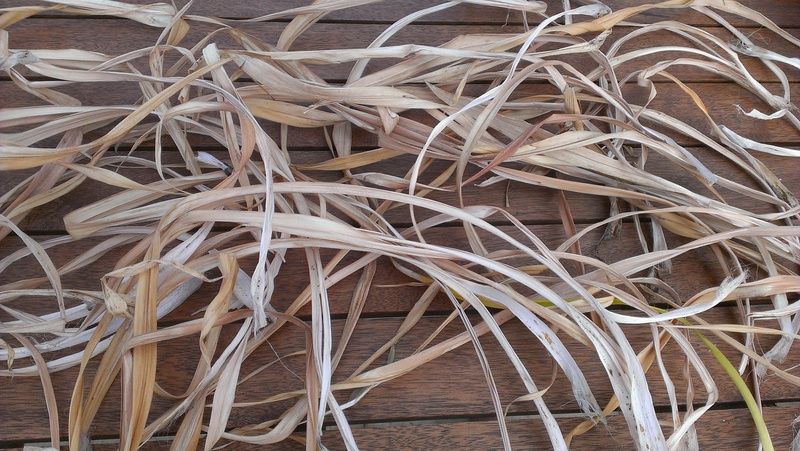 When I strip off the leaves that have died, I make string from them. I’ve been doing this for a few years now. I’m not terribly good at it but I love it. Comparing this string to that of earlier years, I can see I am improving! This is much finer, more even, and my technique is better. The twining (if that is the right word) is better executed. 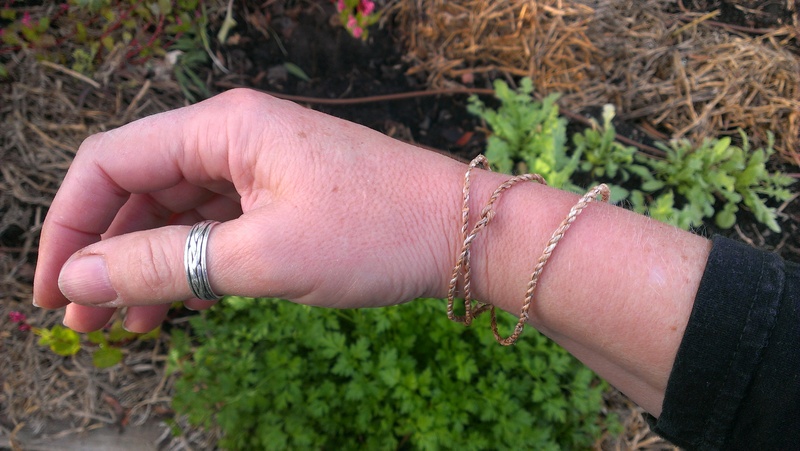 I even made myself a little bracelet. I loved it… but it didn’t last forever, what with being washed and dried and rubbed over guitar strings. In one way, this is perfect. I have come to think that there are far too many things that last forever. The more of them I pull out the council’s mulch the more I respect all that withers and dies and becomes soil again. So perhaps I will make another of these and then another. Shawl colours are superb! and she looks so happy and at home in it. Oh for goodness sake is what I said when I saw your ‘string’… I had no idea…as usual 🙂 We have day lilies here so in a few months i will have to remember that! Yes!!! You are making cordage. I LOVE making cordage. I’ve not done daylilies, but I have uses a local native plant boldly named Rattlesnake Master. I learned how to do this in a basketweaving class a number of years ago, and it was hands-down my favorite part. My teacher thought I was nuts. And still does. But it is so soothing, so wonderful. 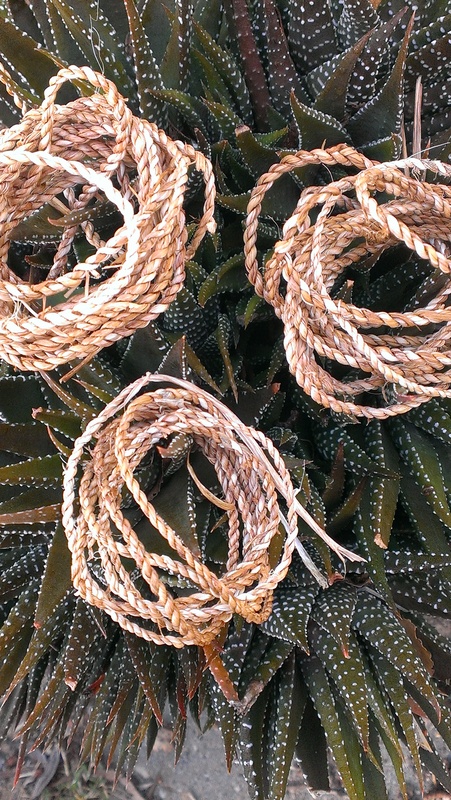 Anyway, as I was taught, it is called making cordage. Twining is something that you can do with it–a particular weaving technique that I also love (which contributed to my teacher’s opinion of me and my basketweaving inclinations, lol).